The perennial complaint I hear about The Legend of Korra is that Korra herself can be a bit obnoxious, distracting us from the rest of the show. This week, we got a nearly Korra-less episode—and it was pretty great. I was pretty optimistic about the whole Korra-getting-swallowed-by-a-dark-spirit thing from last week's episode. I was excited to see Korra away from her friends and give the Republic City characters a little room to breathe. And this episode gave us some of the worldbuilding that we loved from Book One, namely what the Avatar world looks like in a technological age. The big technology here is the moving picture and its power as propaganda. Not only is Varrick's plan to turn Bolin into a serial matinee hero brilliant, the "talking animal" bits are hilarious. I was laughing so hard at Naga's transformation into a talking panda bear dog that I nearly missed how enraptured the children in the theater were. Varrick knows how to win hearts and minds. But the focus of this episode was on Mako and Asami, who have rather rich and difficult lives outside of Team Avatar. We finally see where all of the stresses and tragedies of last season have landed her. She's still practical and tough enough to put on a brave face (most of the time), but she's effectively an orphan, her family name is dirt, and Future industries is failing. It makes sense that we'd eventually see her crack. When I watched this kiss last night, I definitely cringed. Asami and Mako's breakup was awkward but clean; I never got the impression that Asami was waiting for Mako and Korra to break up so she could jump back on the Mako train. (Also, the way none of the Triads believed that Mako dumped Korra? So good.) 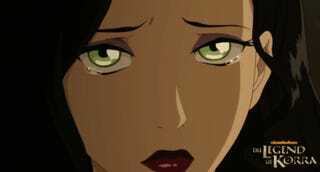 But the more I thought about it, the more I felt the kiss was a symptom of Asami's intense loneliness. She has few allies and fewer friends, and the fact that Mako was willing to help her without question and continued to believe in her ability to save Future Industries even when she didn't believe in herself gave her something to cling to. She kisses Mako, I think, for much the same reason she leaps at Varrick's deal. I do love the shift in Varrick's hat from gray to black, in part because I'm up for fun antagonist, and in part because he's specifically Mako and Asami's antagonist, not Korra's. 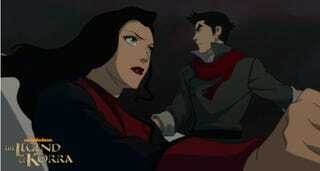 I think that both Mako and Asami have a lot to gain from this shady Varrick arc. Mako will have to use his brain to outwit Varrick if he wants to void Asami's contract with Varrick, and Asami will have to regain her confidence to stand up to Varrick and truly claim Future Industries as his own. In the meantime, I'm looking forward to Bolin's increasing fame. Wow, I really do love it when bad things happen to these characters. 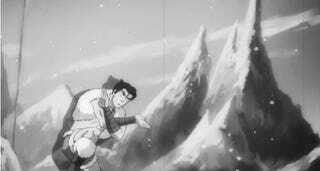 How do we deal with Korra's sometimes problematic personality? Why don't we erase it? 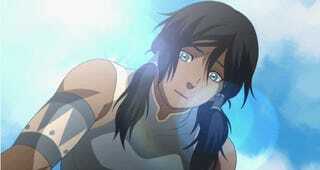 I'm wondering if Korra's memories are stored somewhere in her head, or if the dark spirit ate them. Either way, it will be interesting to see a version of Korra who isn't weighed down by her sheltered childhood and her resentment of the adults in her life. I'm hoping that her amnesia lasts a while, and that she becomes a more mature person by the time she wins her memories back.